This article is part 2 in a series. The first article in the series provided an Overview of presenting with the iPad. Setting up an Ad Hoc network (otherwise known as peer-to-peer network) is actually quite simple on the Mac. I think it is just as simple on the PC, however, I no longer have a PC laptop, such that I cannot test solutions. If you can test these configurations on the PC, I'd love it if you would either blog at your site and let me know so I can link to it, or you could do a guest blog post here. If you do not require Internet sharing (and this is a big IF), then setting up an Ad Hoc network is not complicated. 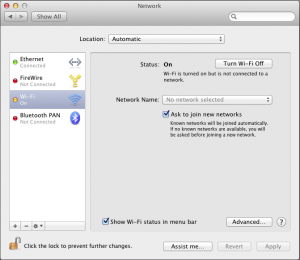 What you want to do is create a new network on your Mac or PC, then connect your iPad to it. Once the network has been created, and your devices are connected, you can use applications such as Air Server and Reflection to mirror your iPad display on your laptop (for projection to the screen) or Air Display to use your iPad as a secondary monitor for your laptop (useful when you want that second screen while travelling). 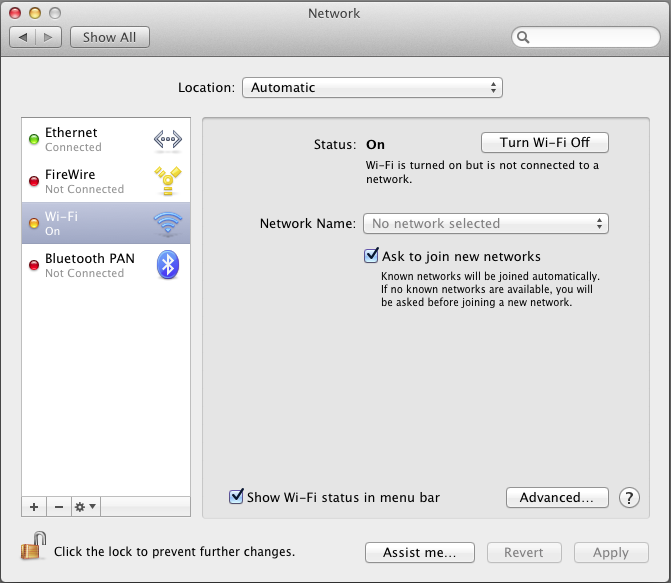 Ensure that the Wi-Fi status is shown in the menu bar. 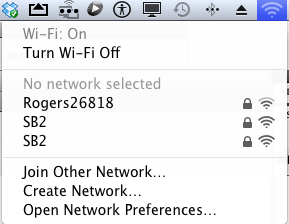 Check "Show Wi-Fi status in menu bar". Give the network a name and select your security level. I advise setting up at least a minimum level of security, as you don't want everyone at the conference or in the classroom connecting to your laptop while you are trying to present! 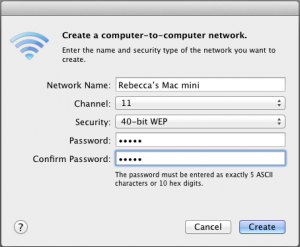 You have two options 40-bit WEP which uses a 5-character password and 128-bit WEP which uses a 13-character password. Remember that whatever you set as the password, you need to enter on you iPad in order to connect. 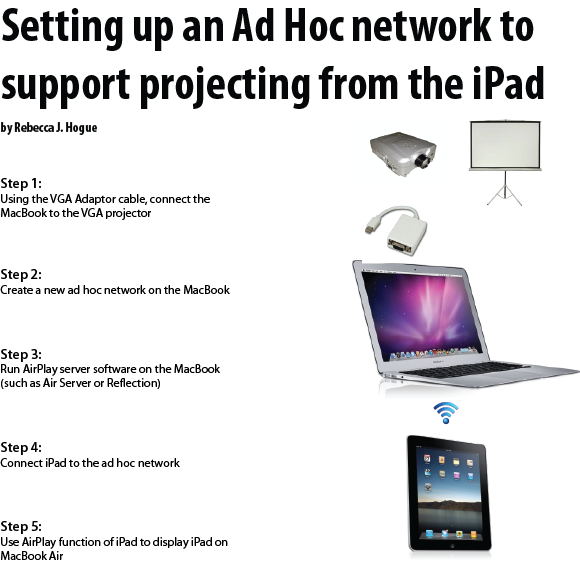 Once the Ad Hoc network has been created, you will want to connect to it from your iPad. Select your Ad Hoc network. The biggest issue with the Ad Hoc network solution is that you do not have Internet Access. This solution creates a network between the Laptop and the iPad, but has no source for Internet connectivity. If you are planning to use this solution, I recommend that you test all your applications in airplane mode first. When I was travelling in Benin with limited and very slow Internet, I was surprised to discover just how many of my iPad apps wouldn't open or function because they required Internet access. Personally, I'll use this configuration for conference presentations. I do not like to rely on Internet access when presenting in unfamiliar locations, so I will have everything I need for my presentation locally on my iPad or MacBook Air. I can then connect the MacBook Air to the projector (with the VGA adaptor cable), create the Ad Hoc network on the MacBook Air, run Air Server on the MacBook Air, and connect my iPad via Air Server and the MacBook Air to the projector (see picture below). I'm investigating options for reliable Internet sharing solutions, and will post on that topic once I get a few of the configuration options working. Excellent site. Excellent Articles. One question. Do you have any idea what the range is for an Ad-hoc network is. That is, how far from your macbook air can you roam with your ipad? Sorry David, I don’t have a good sense. My thought would be about 100 feet, but I have not had to test it. I am usually within 5-15 feet when I present. Thanks for the note. The challenge I’ve found is that the solution requires a wired Internet connection. I have found that very few places provide the wired connection.